While looking at examples on Producer Consumer using Java I was not able to find much of practical examples so let’s take some real time example. 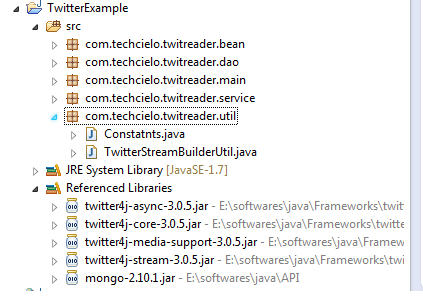 As explained in last blog we can read stream provided by Twitter using Twitter4J api which sends us real time Twitter data. So now lets use this feed as producer and we design a consumer that will check count of twits that we are getting for particular key word. So first we will change our StreamReaderService to accept a queue and list of keywords as follows. Now we will create a consumer that will accept keywords as constructor argument and when twit comes to this queue we will check for index of keyword in it and display count for each keyword. So following will be our consumer class. Now we will create a class to start producer and consumer service as follows. So when we run this code following will be output. [Mon Feb 24 14:17:30 IST 2014]Establishing connection. [Mon Feb 24 14:17:34 IST 2014]Connection established. [Mon Feb 24 14:17:34 IST 2014]Receiving status stream. Got twit:I shouldn't whatsapp him anymore. Or maybe once in 2 weeks time only. Got twit:RT @molnia_sport: ?????????? ??? : ?????? ???????? ?? ?????? ???? ???????? ? ??????? ?, ?? ? ??????? ????? Got twit:RT @orangeflower08: ??????????????????????????????????18????????????????? #???? Got twit:aku gk pake BB @vivinopiw_ aku pake Whatsapp, kmu pake gk ? Got twit:@iliacolmenares te escribo a whatsapp y nada, no se que le pasa a mi teléfono... Poblado esta totalmente trancado desde las 3 am. Got twit:RT @jonipikkuinen: Varoittakaa lapsianne klikkamasta "whatsapp-vanhenee tänään"-linkkejä ja vastaavia puhelimessa. Joutuvat FunLimen 79€/kk.